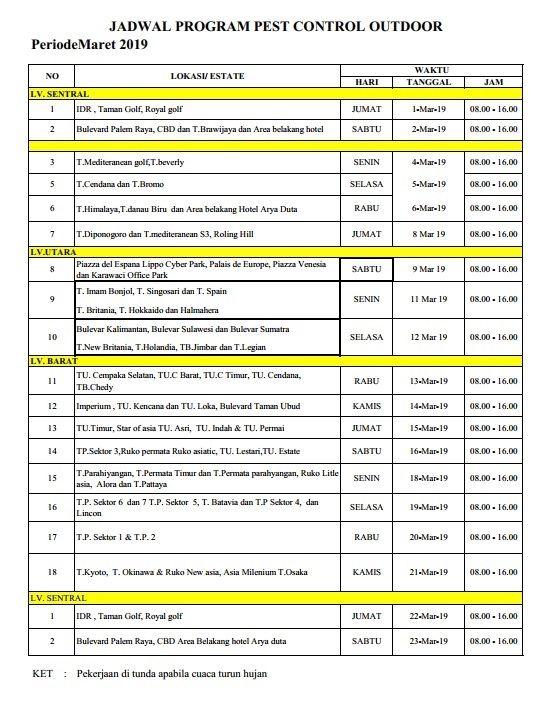 The program will be implemented starting on Friday, 1 March 2019 (please see below schedule). In anticipation, please conserve on the use of water and store sufficient quantity at least in the next a week. However, our water truck will be on standby for your urgent water requirements. Please call our Emergency at 0800 1900 911 for any assistance. We apologize for any inconvenience caused. Thank you for your patience and understanding. To improve our services, we will do a routine pipes cleaning for clean water at Lippo Village North and Lippo Village West from 18 to 22 February 2019, starting from 10 AM to 4 PM which can affect the quality of the water that we distribute. Before the activity takes place, we suggest you to close the tap in the water meter until it is finish and if the water supply back to normal, please flushing the water before you use it. We apologize for any inconvenience caused. Please contact our Call Center at (021) 55 777 557 if you need further details and information. Please be informed that the main pipe connecting works of PDAM is still ongoing until today, Friday, 15 February 2019. Our water truck will be on standby for your urgent water requirements. Please contact our Emergency officers at 0800 1900 911 for any assistance. We will keep update you on this matter. We apologize for any inconvenience caused. Please be informed that the main pipe connecting works of PDAM since Wednesday night, 13 February 2019 is still ongoing. Our water truck will be on standby for your urgent water requirements. Please call our Emergency at 0800 1900 911 for assistance.